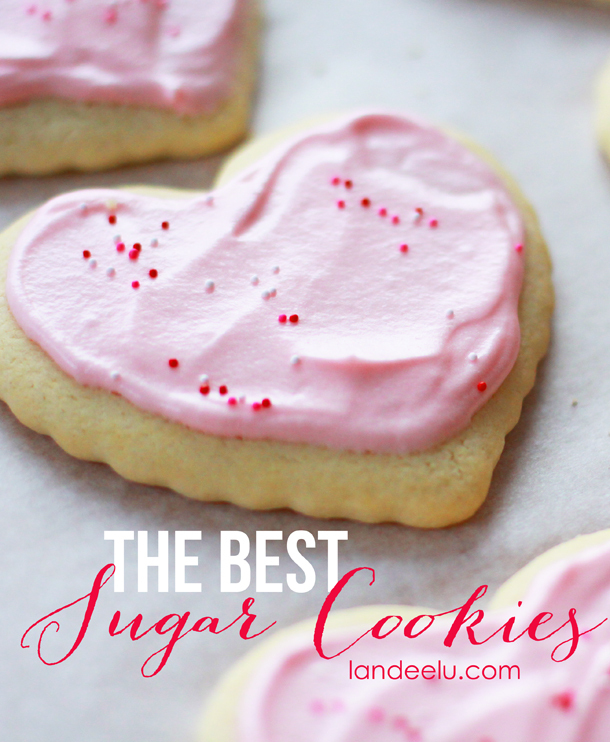 I’m guessing you’re here looking for THE BEST SUGAR COOKIE RECIPE, right? Well you are definitely in the right place! So glad you’re here! The title of this post and recipe is not a brag in anyway. That is simply what they were called when the recipe was given to me at my bridal shower almost 17 years ago. Wait… seventeen? That can’t be right ::counting on fingers from April 1996:: Holy cow. That IS right. Yikes! Anyway, my beloved mother-in-law threw me a neighborhood bridal shower waaay back when and the “theme” of the party was to bring something related to the month you were born. One of the ladies was born in December so she gave me cookie sheets, hot pads, a spatula and this amazing cookie recipe (fun gift idea, don’t you think?). I have made these cookies every Christmas since then and my daughter now requests them for her class when it’s time to celebrate her birthday. Her birthday was last week so I thought this was the perfect time to share the recipe with you! I love them because they are a great texture (the perfect mix between chewy and cakey) and nice base to whatever frosting you might want to put on them (my favorite is a cream cheese frosting of any kind). They hold their shape and bake up nicely and are super sturdy/won’t fall apart on you. Click NEXT PAGE for the recipe! Click here to download a printable version of THE BEST SUGAR COOKIES plus my favorite Cream Cheese Frosting Recipe! Yummy! I’m definately going to try this recipe. Thanks for the recipe!! I’m excited to try these! Do you have a recipe for the cream cheese icing? I don’t have MY OWN cream cheese frosting that I prefer but I’m guessing any recipe you find out there would be awesome! I often just use a can from the store too! I made these cookies to send to my niece at college. They were the best cookies I have ever made. She is heading back to school next week and dropped a hint that she wouldn’t mind if I sent her more of these cookies. Ah! I love that Denise! You just made my day! So glad you love them too! Hi there. Could I just check is C for cup and T for tablespoon? I am in Australia and would love to try these cookies but want to make sure I get it right. Thanks so much. Yes! C for cup and T for tablespoon. Thanks for stopping by! Thanks so much Landee. I used this for my daughters party on the weekend and they were fantastic! Thank you! Hi, how long can I leave the dough in the fridge? What is the yield for this recipe ? Love these sugar cookies and they are great for kindergarten class parties (my kid’s teacher raved about them). Anyone know how short a time one could put the dough in the freezer and still have it set up so that you can work with it? Overnight requires more forethought than I can sometimes manage.